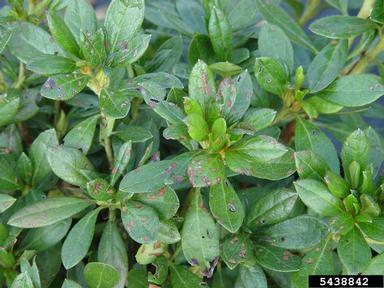 Strawberry rootworm (Paria fragariae) is typically only found in perennial strawberry production and are actually more significant pests in ornamental plants. Strawberry rootworm adults are small (1⁄8 inch long) beetles with a light brown abdomen with 4 large dark spots and a deep, dark brown thorax. 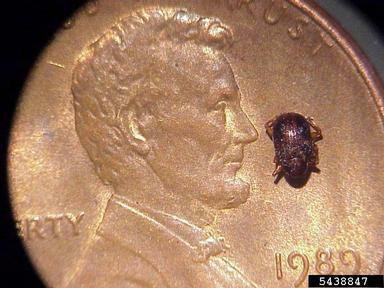 Adult beetles overwinter in protected areas and emerge in mid spring and remain active until early summer. Female beetles lay eggs are laid on older, lower canopy leaves. Strawberry rootworm larvae, or grubs, feeds on the roots of strawberries, but this damage is rarely economically significant. Adults beetles feed on leaves leaving small, round holes about 1⁄16 inch in diameter. Adult strawberry rootworm feeding in ornamental crop. 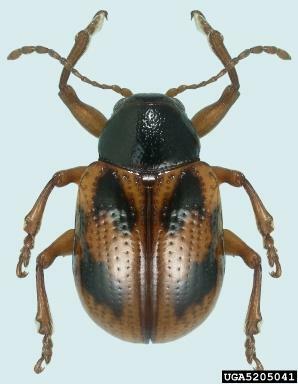 Adult beetles can be sampled via direct observations, sweep netting, or shaking plants over white sheets or paper. Strawberry rootworm adults typically feed after sunset, so it may be useful to visit damaged areas of the field in the evening. Infestations of strawberry rootworm in North Carolina are rare, and this pest is not included in recommendations in the North Carolina Agricultural Chemicals Manual or the Southern Region Small Fruit Consortium Strawberry IPM Guide for regional recommendations. For other states, check with your local extension agent.